Chelsea attacker Willian has urged the Blues to keep hold of David Luiz beyond his existing deal which expires at the end of the current season. The Brazilian has managed to reclaim his starting spot under the guidance of Maurizio Sarri this term and he has started in all but one league game. Despite this, he has struggled to find the breakthrough over a new contract amid Blues' shrewd policy with players aged above 30 but Willian remains optimistic that Luiz will stay put beyond the summer. "We have to see if they club will want him. I think they want (him). For me, I want him to stay. David has a lot of quality to do these kind of passes," he is quoted by The Mirror. 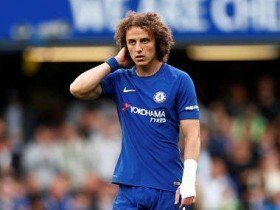 Chelsea have generally offered one-year extensions to players above the age of 30 but Luiz is said to want a two-year contract which has stalled negotiations. Still, there remains hope of the Brazilian's demands being matched with Sarri regularly iterating the importance of keeping hold of the central defender.